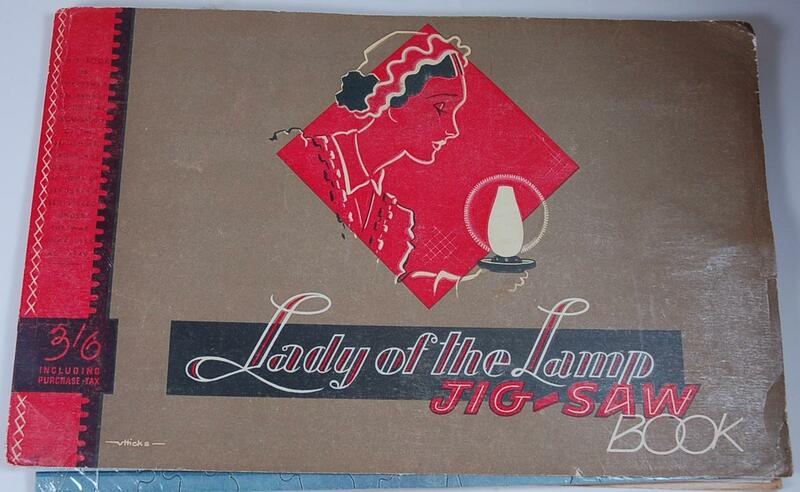 Lady with the Lamp Jig-saw Book' with a design of grey/green background and illustration in red, cream and black of a profile of Florence Nightingale with a lamp, signed 'Hicks'. Text consists of the title and: '3'6 INCLUDING PURCHASE TAX/ This Book is published on behalf of the British Red Cross and Order of St John of Jerusalem Registered under the War Charities Act 1940.' Reverse has 'Instructions for Assembly of the Box' and an explanation that the board can be used either as a foundation upon which to assemble the puzzle or as a box in which to place the puzzle should you wish to send it to someone in one of the services after you have finished with it. Conatins two jigsaw puzzles: one consists of twelve poster adverts for the companies who have financed the book; William Younger's Beer; Heinz salad cream and mayonnaise; Shredded Wheat, State Express cigarettes; Raleigh bicycles; Oxo; Foster Clarke's soup squares, Caley chocolates; Peek Frean biscuits; Kia-Ora lemon drink; Crompton light bulbs, Ford Motor. Second depicts Florence Nightingale in a group setting during the Crimean War, assisting an injured/sick man. Inside also includes a page with: 'The Story of Florence Nightingale' on one side and on the reverse: 'Appreciation. The Chairman, Col. The Rt. Hon. Lord Wigram and the members of the Sports Committee of H.RH. The Duke of Gloucester's Red Cross and St John Fund, wish to tender their thanks to the advertisers whose generous co-operation has made the publication of this Book possible' and they are listed below.